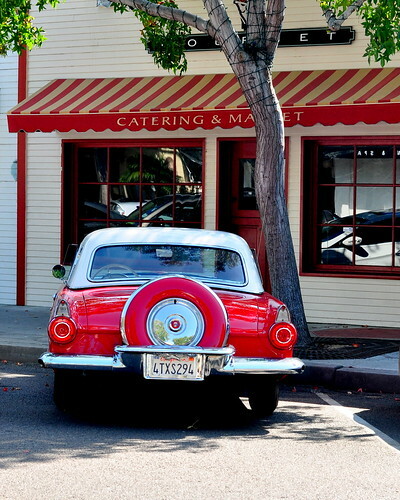 You will see some great-looking vintage cars in California. Probably because the weather is so much easier on them. We spotted this Thunderbird one afternoon last month and even though the light was lousy and I had the wrong lens, I couldn’t resist shooting. I believe it’s from the 50s. 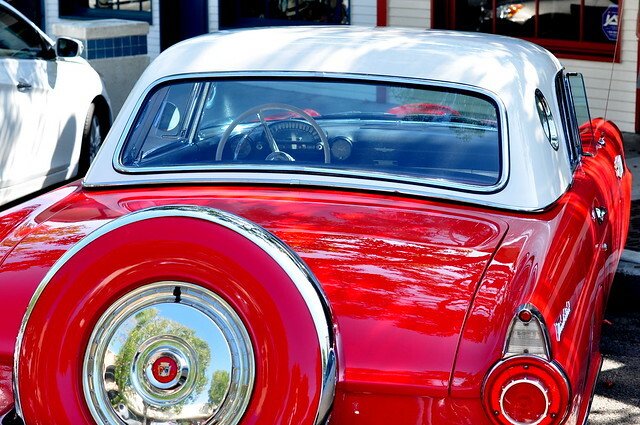 Talk about mint condition. We didn’t see a smudge, let alone scratch, anywhere. The white parts were really white, after all those years. 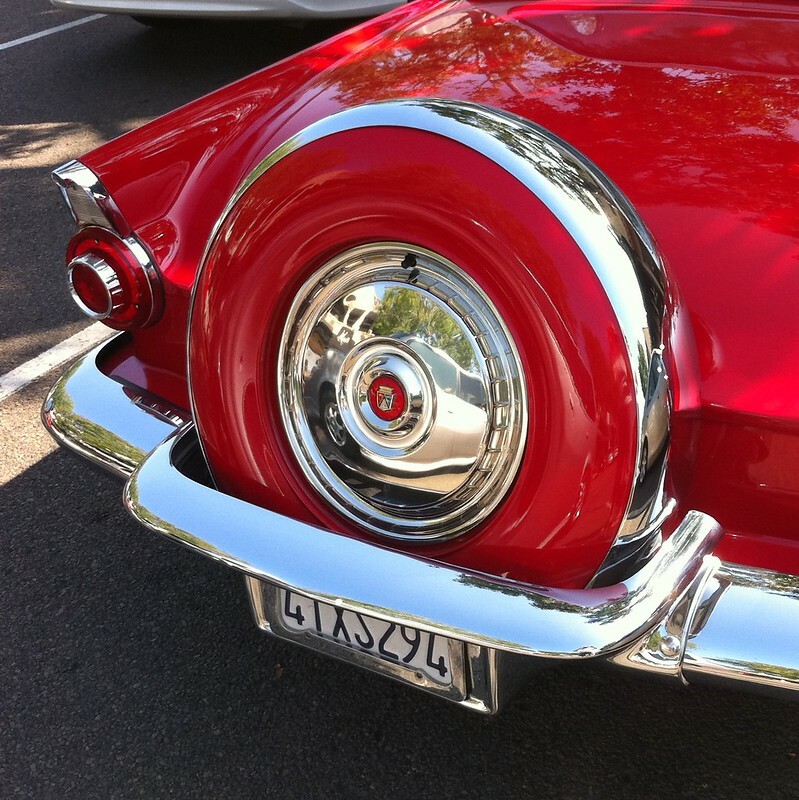 Yes, you can see yourself in the red finish as well as the chrome. I was soon surrounded by guys in their twenties snapping away on their iPhones. They very graciously gave me room to shoot. 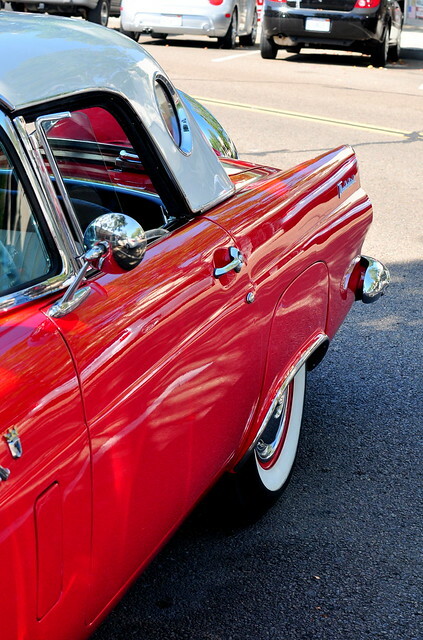 Probably no seat belts, and most certainly no headrests, but oh so beautiful to look at. Somehow, the front of the car isn’t as great as the rest. Kudos to whoever restored this beauty. 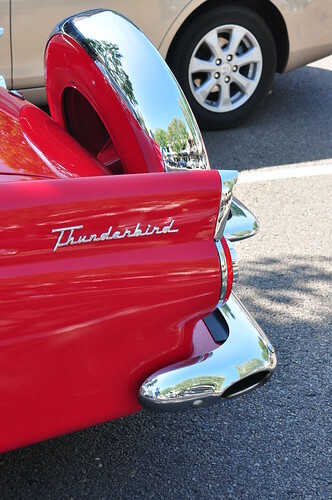 This entry was posted in photography and tagged chrome, classic Thunderbird, red car. Bookmark the permalink. Thank you. I was really wishing I’d brought my zoom lens with me. The 50mm made it a lot more challenging. Thanks too for dropping by! It’s in amazing condition. I’ve seen a few great vinatge cars in San Francisco come to think of it. We happened on a show for vintage woodies (surfer station wagons) recently too. I’ll be blogging about that soon. Didn’t realize you’d been to San Francisco, one of my favorite cities. How did you like it? If I say I loved it it’s an understatement. I was offered a job there this year. The company I’m working for has one of the main offices there. But I don’t want to stay with them or I might have considered it. It’s such an amazing city. Many say that San Francisco has a real European feel and I agree. Wow, it would be wonderful if you worked up there, but I understand completely. 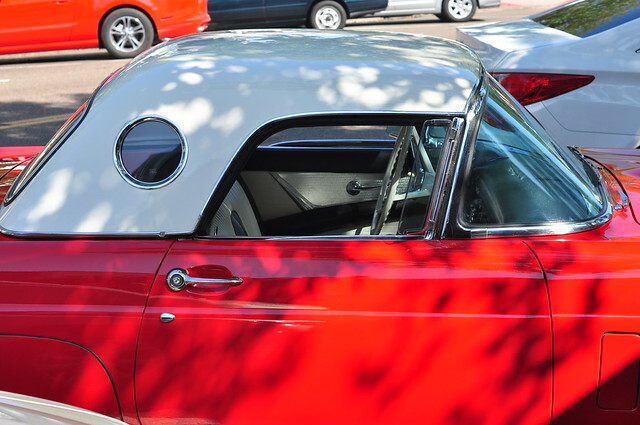 Even to a Limey, the porthole TBird is iconic. 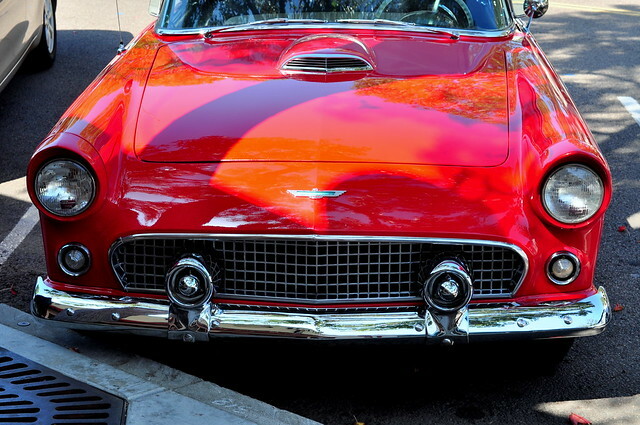 And it’s red – fantastic. That is just a beautiful machine. I’ve seen another one in aqua, but it wasn’t nearly as nice as this. Beautiful photos. 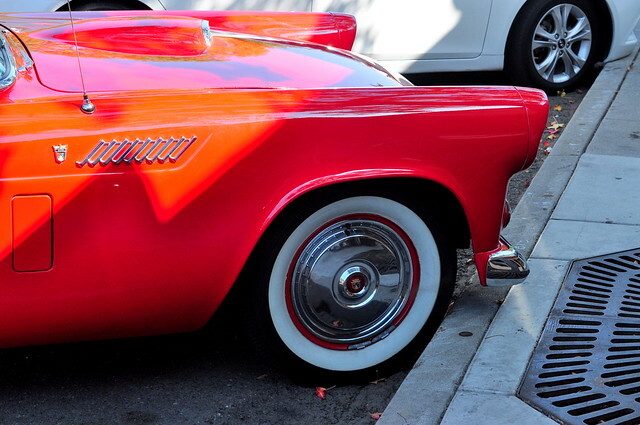 I need me a classic car! 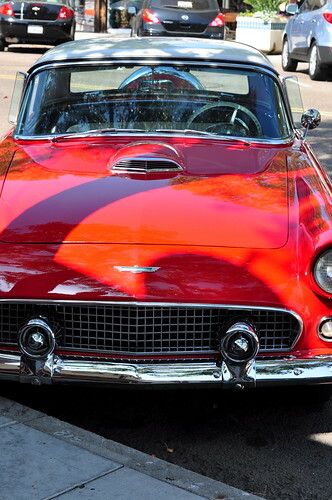 I need me a classic car! I’d be afraid to take it out of the garage. Ha ha! I was wondering how they could stand to park next to other cars. We don’t own a classic, but I hate getting the car dinged. I think a lot of owners just bring these cars out on the weekend. Gas is really expensive here now. One place was charging over $4.50 a gallon! It is in mint condition. Astonishing, really! OMG, Carole … you won’t believe this, but you have just presented a dazzling array of my VERY FIRST CAR, although it wasn’t in this mint condition. Finally gave it up when I had to run back and pick up the parts falling off every time I crossed a bump … railroad tracks finally finished her off. Having another coffee and a little nostalgia trip. A wonderful array from Pearls and Prose … of MY VERY FIRST CAR! Of course it wasn’t in this mint condition even back then. Someone before me had NOT loved it and I lost parts at every bump in the road. Railroad tracks were it’s final demise. Thanks for this nostalgia trip, Carole. I will stroll through these incredible images whenever I feel lonely for my youth! Wow, lucky you, Cheryl! It must have been tough to say goodbye to that car.